For two years now, Ardith Rutland has taken up the mantle of caring for the beloved ‘Pete’s Park’ located in the heart of the Coffee Pot Riviera neighborhood, on Snell Isle. When asked why, Ardith says, “From my kitchen window I can see the park, and for years the beds were overgrown and unsightly. I felt sorry for the lonely griffin statue in the corner of the park across the street from my house. The griffin was dirty and the flower bed was overgrown with weeds. I just got tired of looking at it! I decided something needed to be done, so I just started taking care of it.” Now, when Ardith looks out her kitchen window, from her home on Coffee Pot Riviera, she sees beautiful flowers and gleaming white statuary that has graced the park for generations. Ardith is welcoming, spunky, and sweet natured. 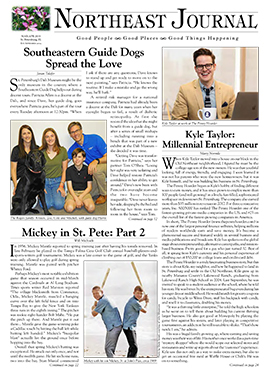 She has an abounding love for her children, family heirlooms, all things collectible, and Pinellas County. Born and raised in Clearwater, Ardith came to St. Petersburg after marrying into the established Rutland family, of Rutland Bank fame. In 2000, Ardith moved into the home she had custom-built on Coffee Pot Riviera. She has served as a neighborhood fixture ever since. She is proud of Coffee Pot Riviera and Snell Isle. She wants that pride to show for both her and others to enjoy. On sunny days, you can see Snell Isle residents playing with their children and walking their dogs in ‘Pete’s Park.’ Many park-goers and Coffee Pot Riviera residents have no idea that the lovely corner garden beds full of ivy, palms, and blooming flowers are a result of Ardith’s efforts. 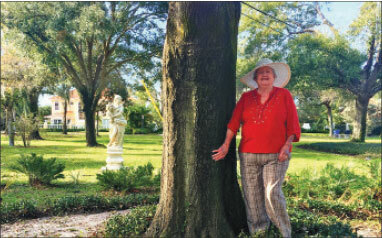 While the City of St. Pete mows and waters the park’s grass, Ardith personally has spent hundreds of dollars on plants, landscaping, and routine labor to maintain the corner garden beds. The project began with Ardith rehabilitating the garden bed on the north corner of the park located directly across the street from her home. Eventually, it grew to encompass the east corner which greets visitors and residents upon passing through the old gate columns of Coffee Pot Riviera. She now is working to include the west corner bed and a fourth that runs along the eastern flank of the park. On weekends, you can see Ardith and James, her landscaper, weeding, planting, and watering the beds. With the additional help of a Snell Isle neighbor or two, she is able to clean the statues and benches that have adorned the park for decades. Ardith asks for nothing in return for her efforts. She simply is happy to keep her neighborhood looking beautiful for everyone who lives there and visits it. Ardith is quick to point out that she is not the park’s first caretaker. 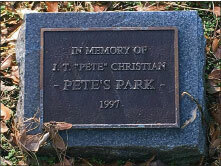 The park called ‘Pete’s Park’ bears the name of long-time Coffee Pot Riviera resident and local legend, Pete Christian. During Mr. Christian’s time, he, too, saw the park fall into disrepair. So, he stepped in to save it. Mr. Christian was responsible for adding irrigation, trees, landscaping, seasonal flowers, and even a horseshoe pit to the park. He cleverly renamed it the ‘Grounds of Coffee Pot’ and the park became the focal point of the neighborhood. After Mr. Christian passed away, the park’s corner gardens were maintained intermittently by other concerned residents. Nonetheless, maintenance was costly and time consuming. Over the years, the flower beds slowly became overgrown once more. Fortunately, Ardith silently stepped in and has maintained them, without any fanfare or thanks, ever since. Thank goodness, indeed, for Ardith Rutland!